nailhed: Yoopee Expedition 2006, Pt. 3: "Calumet's Loss, Detroit's Gain"
Yoopee Expedition 2006, Pt. 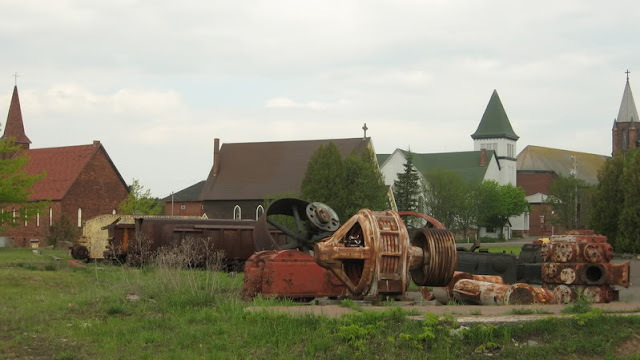 3: "Calumet's Loss, Detroit's Gain"
After dark I arrived in Copper Harbor, Michigan's "northernmost permanent human settlement," a village of less than 50 residents on Lake Superior's pristine rocky shore. It is a lonely, winding road that goes here, before dead-ending at the end of the world. This is our "Land's End"...severe and inhospitable but for modern supply lines. The only reason anyone ever settled it in the first place is because of the initial copper rush in 1843. That's also when the Army built Fort Wilkins here to maintain law and order between the newly arriving droves of miners and the native Anishinaabeg people. Fort Wilkins is now a state park, and I explored it in another post. The 1,300ft Mt. 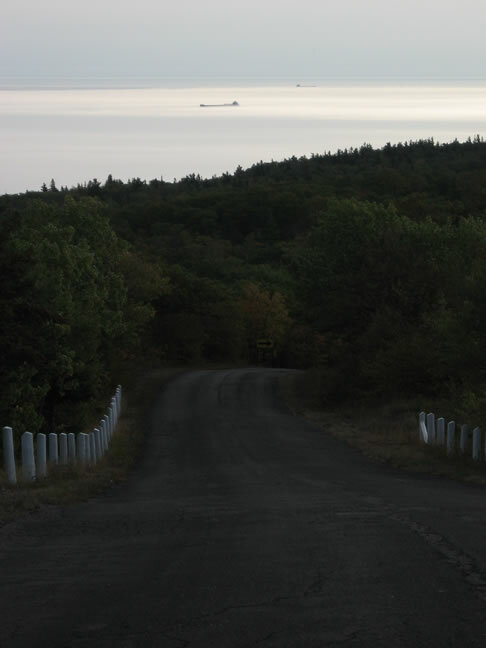 Brockway overlooks the harbor, and I climbed up there in my poor little car early the next morning. The view was absolutely incredible though...when I reached the top I could feel the immense desolation about me. The knowledge that you're alone in a gigantic wilderness is only magnified when you can actually see that it is true, sprawled out away from you in all directions for miles and miles instead of being cocooned in a dense forest. Usually there are other people up here, but this morning I was alone. Nothing could be seen but endless green mist-shrouded mountains and the infinite, unforgiving vastness of mighty Lake Superior beyond that. One would expect a vantage point like this to involve the roar of whipping winds, etc., but everything was silent and utterly still. Nothing could be heard but a few birds chirping; there was no wind this morning, even at this altitude. It was as if the whole world had been frozen in glass. An old weather station (turned tourist shop) capped the top of Mt. Brockway, and since no one was around I climbed partway up the radio tower for a better look. Still, nothing but more nothing. It reminded me of the part in The Hobbit where Bilbo climbs the tree and pokes his head above Mirkwood Forest but sees nothing but more trees stretching out into infinity. Eventually I heard the distant churning sound of an ore freighter chugging its way east to the Soo. I could see its long, lonely silhouette on the horizon. The ship was miles away, yet I could still hear the deep whirring of its engines--a sound so faint that it would be inaudible anywhere else. It could have been drowned out by the sound of a mouse's heartbeat, but here it was loud and clear and unmistakable. Back in the city, this would be equivalent to sitting in Woodward Avenue traffic and being able to hear someone knitting a sweater on Belle Isle...that's how ridiculous the silence was here. I could hear the grass growing if I listened hard enough. If you want to understand true loneliness, spend some time on the Lake Superior shore. Suddenly the stillness was shattered by the sound of a rifle shot somewhere down in the valley. Hunting season was still a month and a half away, but nonetheless I heard the sharp, unmistakable CRACK! tear across the mountain gap. Because I was so far above it, it sounded elongated; drawn out like a laser, and began to turn left, following the curvature of the mountainside. Then all was silent again. There was much to do today, so I descended from Mt. 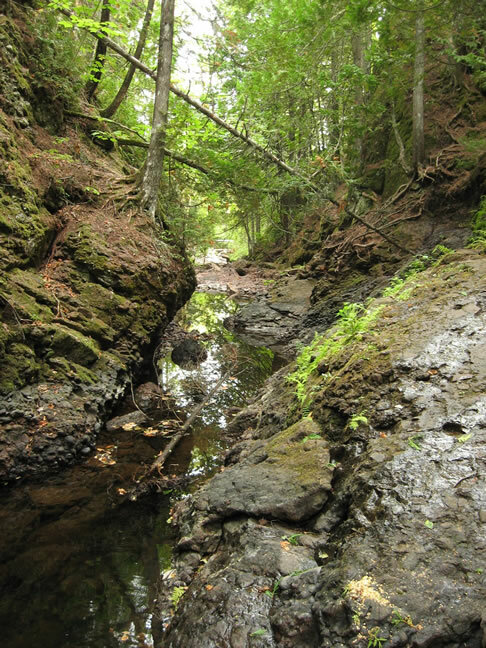 Brockway to seek out Manganese Falls. Then I hiked a couple miles through the Estivant Pines sanctuary, one of the few remaining stands of old-growth white pine in Michigan. Not quite the Redwood National Forest, but still sweet. Coming back into town I saw the Copper Harbor Light, was the first lighthouse site on Lake Superior, built in 1848 soon after Fort Wilkins. Even in the middle of a sunny summer day it was intermittently shrouded in cold mist. The stuff seemed to come and go every ten minutes. Lake Superior can be weird. The lazy clanging of a bell-buoy somewhere off in the murk was the only thing I heard as I took a nap on the rocks for awhile. After I had satisfied myself of having seen Copper Harbor I finally began the 600-mile-long journey back to Detroit by following the craggy, nordic shoreline to Eagle Harbor, a town so small that its only attraction is its lighthouse. Further on, I drove through the famous though disinherited town of Calumet, once home to the richest mining company in the world, Calumet & Hecla. I was enthralled by this little town. It was a page crudely torn right outta the year 1895, perfectly preserved–not restored or primped in any way...everything was aged and weathered–it seemed no infrastructure had been updated since Zachary Taylor was in the White House and the copper rush was in full swing. The other aesthetic at work here was a prevailing feeling of loss and shiftlessness. The copper boom dried up long, long ago, and thus Calumet's main reason for being also came to an end. It is now very much like a ghost town despite its population of a few hundred people. The streets are usually empty and half of the gorgeous sandstone buildings are vacant; everywhere are the crumbling stone ruins of the mining industry that have been sitting there for over a century. It was somehow refreshing however, to see what was essentially a doppelgänger version of Detroit; to know that somehow, we weren't the only city to completely and permanently fall apart after the collapse of our industry. And Calumet was showing that a city could age gracefully, without the terror and wanton destruction we were experiencing. Again, the architecture in this town was incredible. 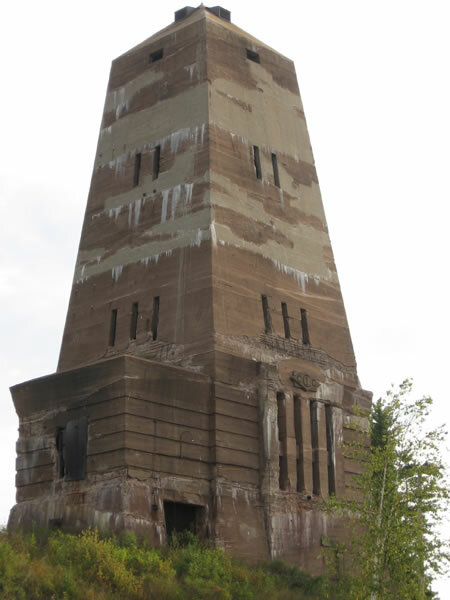 Partially thanks to the Keweenaw National Historical Park, it seemed like almost nothing had been demolished from the old mining days; it was all still being used as-is, and few modern structures have been built. A minute later, it finally registered in my brain...this meter was so old that it only accepted nickels and pennies. Five f#$%ing cents lets you park for one hour.... That's when I finally realized the full scope of the hillbillitude at hand here. Why do they even bother? I couldn't believe that one could still buy something for a damn nickel. And like every other building in town they were all of 1800s vintage, and constructed of that sweet-looking local sandstone and poor rock. It's common around the Yoopee, but here in Calumet it's like that's all they built anything with, haha. But it just goes to illustrate the level of wealth that used to be here in this remote corner of the nation at the dawn of the "American Century." At the start of the 21st century Calumet had a population of about 800 people; in the year 1900, Calumet had over 25,000 people. And of course most of them were recent immigrants from Finland, Cornwall, Wales, Hungary, Croatia, Ireland, Sweden, Poland...even Italy and Mexico. Each ethnic group had its own neighborhood, and subsequently each religious faction within those ethnic groups--be they Lutheran, Catholic, Orthodox--decided they needed to build their own churches and community halls as well. Such were the times in boom-era Calumet, and that is why there is such a plethora of steeples punctuating the city's skyline. One such community hall was known as the "Italian Hall." It was the scene of perhaps the most infamous tragedy in Michigan history, at the height of the Copper Strike of 1913. The doorway to the demolished building stands as grim monument to what was dubbed the "Italian Hall Massacre," and is nicknamed "Death's Door." Knowing the history behind this solemn monument and what had happened there, I felt a bit uncomfortable, and did not linger long. Following the terrible strife and hardship of the bitter (and unsuccessful) strike of 1913, many of those who had resisted the mine companies and tried to unionize were forced to leave the region, often because the mining companies owned the homes they lived in. Droves of former copper miners made their way to Detroit, in hopes of securing jobs in the budding auto industry. It should comes as no surprise then that support for the unionization of the auto industry began to swell soon after that time. Usually everyone who considers the industrial history of Michigan immediately thinks of the Motor City, but few remember that Michigan had an equally powerful industrial giant in the Keweenaw Peninsula before the automobile ever caught on. The Copper Country played just as important a role in the formation of Michigan as a true power in the nation as Detroit, Grand Rapids, Kalamazoo, or Bay City, but quickly became overshadowed because Detroit's prowess waxed at the very instant that the Keweenaw's waned. If it had not been for the inexhaustable wealth of copper and iron in the Yoopee, America's industrialization would have been extremely hampered, and we might not have become the super-power that we were by the 1940s. Didn't Indiana Jones check this place out in one of his movies? Almost immediately after copper was discovered in the 1840s iron was discovered as well, and the Iron Cliffs Co. originated in 1865, and opened its first mine, the Barnum Mine two years later. In 1877 they began exploring this site. The Cliffs Shaft Mine was one of Michigan's largest iron mines, reaching a depth of 1,358ft., with 65 miles of tunnel, and was the nation's largest producer of hematite (a type of iron ore). When it finally closed in 1967, it basically signaled the end of the road for central-Yoopee iron mining, though the Tilden/Empire Mine still operates today as an open pit. The Cliffs Shaft Mine is now a museum.